I'm in Knitty! Well, my pins are - scroll down. Woooo! And did you see what a great issue it is? I think Amy has outdone herself! So onward to the no graft toe up sock cast-on tutorial (seen on a soap sack). :) I've also seen this called the figure 8 cast-on on the Wiseneedle site here. The first time I used it, on a top down hoodie, I had to fiddle a lot with it, but now it's getting easier. 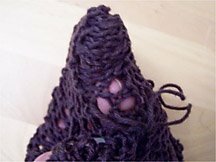 The whole idea of this cast-on is to keep from having to graft or seam the bottom of the tube you are knitting. Because of this, take special care not to twist any stitches. Twisted stitches will show up as little lumps when you tighten up the bottom. To start, select two dpns that are larger gauge than those you will be using. The bottom will be quite loose, but it will be tightened up in the last step, and it is easier to begin with more play in the yarn. In the following pictures, I am using US 9s to start a soap sack that will be worked on US 6 dpns. At this point, it is important to make sure that you still have enough loops on the other needle. When you get to the end, it is easy to lose that last loop! Now you will be turning the corner around the needles, just as though you are working in the round (which, really, you are). Make sure you do not twist stitches! The stitches on this needle will lay opposite the ones on the first needle, so if you knitted into the front of the loops on the other side, you will now be knitting into the back, and vice versa. If you have questions, please let me know! It's so easy to show in person and so difficult online! And don't despair if it doesn't work the first time. It took me quite a few tries to get right, and, admittedly, was rather frustrating at first. But on the other hand, that's how I learned some tricks to it! Tune in next time for a tutorial on the modified belly-button start shown in the Sept 4 entry. It's been requested and I can't refuse! Congrats on knitty! Cool tutorial. Thanks! I can't wait to see the modified belly button thingy. I love techniques. You rock!